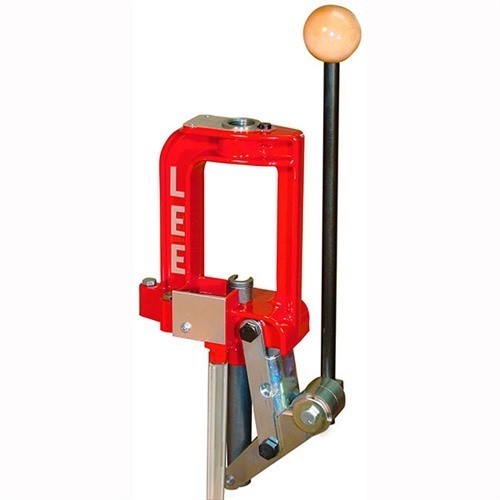 The "O" frame press by design is the strongest and by far the most popular style press. The larger than average opening allows for maximum hand clearance. The spent primer catcher is positive and allows you to route the spent primers directly to the trash can. Priming is a dream with the Lee Lever Prime System. Best of all, it includes the Breech Lock Quick Change die system. Change dies instantly with a twist of the wrist, and you never have to re-adjust your die. Other features include all steel linkage with adjustable length lever. Press includes one Breech Lock quick change bushing. "O" ramme trykk av design er den sterkeste og langt de mest populære pressen. Jo større enn gjennomsnittet åpne gir maksimal hånd klaring. Brukt primer catcher er positiv og kan du rute brukt primerne direkte til søppel kan. Grunning er en drøm med Lee spaken Prime systemet. Allerbest, inkluderer det Breech lås rask endring dø-systemet. Endre dør må øyeblikkelig med en vri på håndleddet, og du aldri re-justere din dør. Andre funksjoner inkluderer alle stål sammenhengen med justerbar lengde lever. Trykk inkluderer en Breech lås rask endring foring. The press has been doing fine for just about one year now. Today as I was depriming/resizing, the part that the handle attatches to cracked. GREAT! Matches coming up and now what? I only have this press so it's hard to compare, but I love it. I got the Kit so it has all the rest of the stuff also, but I have done about 3k 9mm and 4k 223 through it without a problem. The only thing I've had a problem with it gumming up of lube on the piston, but then figured out to use gun cleaner and lube (CLP) and it works perfectly now. You do want to get a BUNCH of the quick disconnects so you can have one on every piece of die so you can set it and forget it. I use this press 3 times a week without issues mainly for pistol loads. good construction for the price, fast die setting. has made thousands of loads. Produsentnr. : 90588 734307905880 "O" ramme trykk av design er den sterkeste og langt de mest populære pressen. Jo større enn gjennomsnittet åpne gir maksimal hånd klaring. Brukt primer catcher er positiv og kan du rute brukt primerne direkte til søppel kan. Grunning er en drøm med Lee spaken Prime systemet. Allerbest, inkluderer det Breech lås rask endring dø-systemet. Endre dør må øyeblikkelig med en vri på håndleddet, og du aldri re-justere din dør. Andre funksjoner inkluderer alle stål sammenhengen med justerbar lengde lever. Trykk inkluderer en Breech lås rask endring foring.